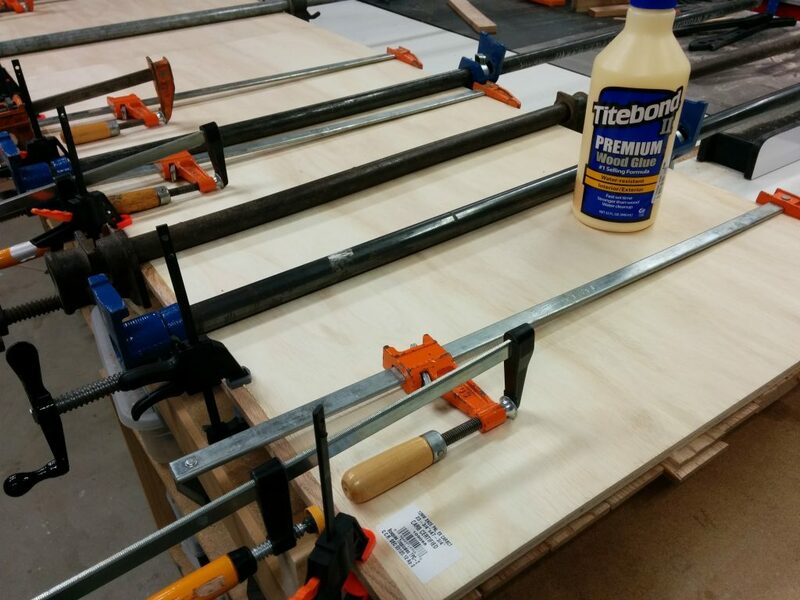 This is a continuation of Workbench: Part 4 – Gluing up the new top. The top is all glued up so now I need to strengthen it by attaching 1/2″ plywood to the underside. 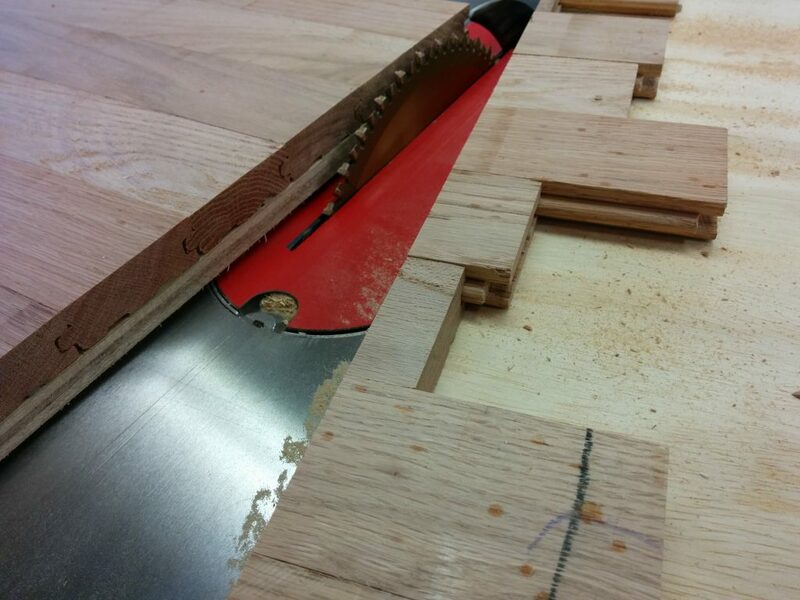 I can then cut it down to the final size to prepare it for finishing. 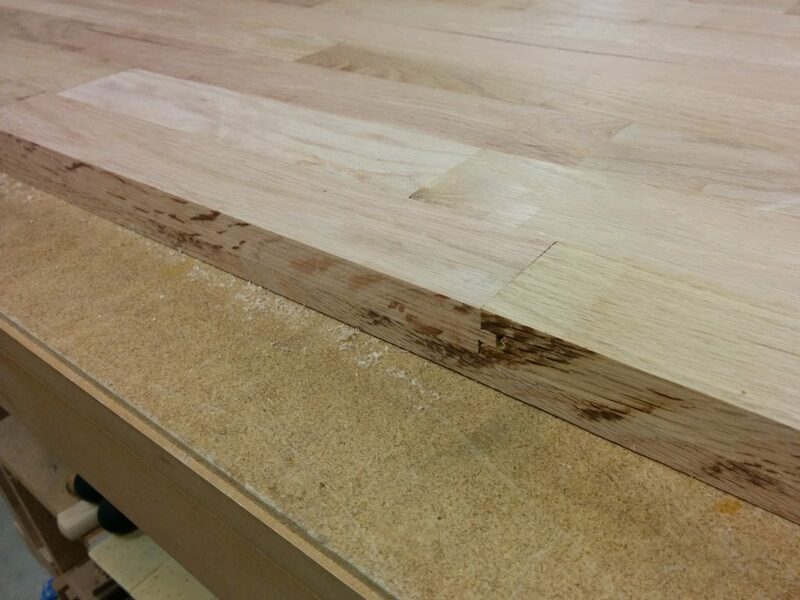 Looking at the underside of the glued up benchtop. 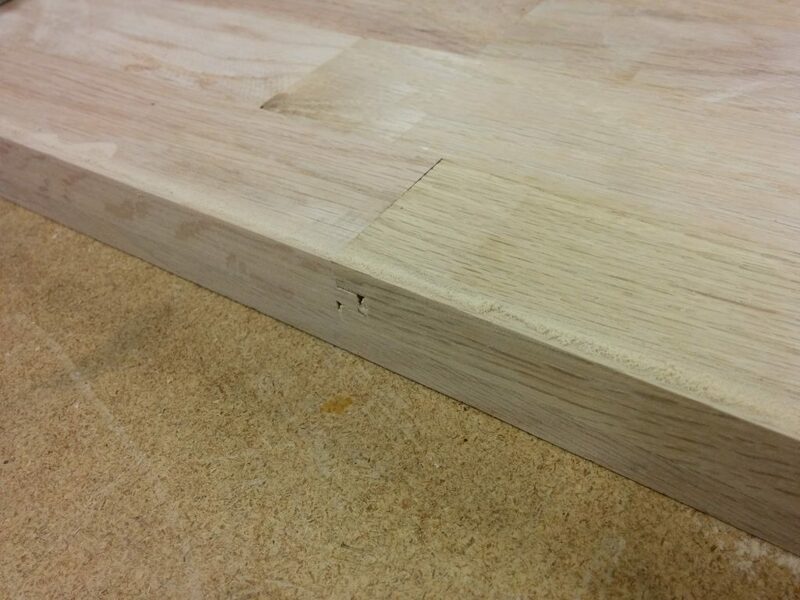 There were a few spots of glue squeeze-out that I decided to remove so they don’t interfere with attaching the benchtop to the plywood. I just scraped them flat with a chisel. 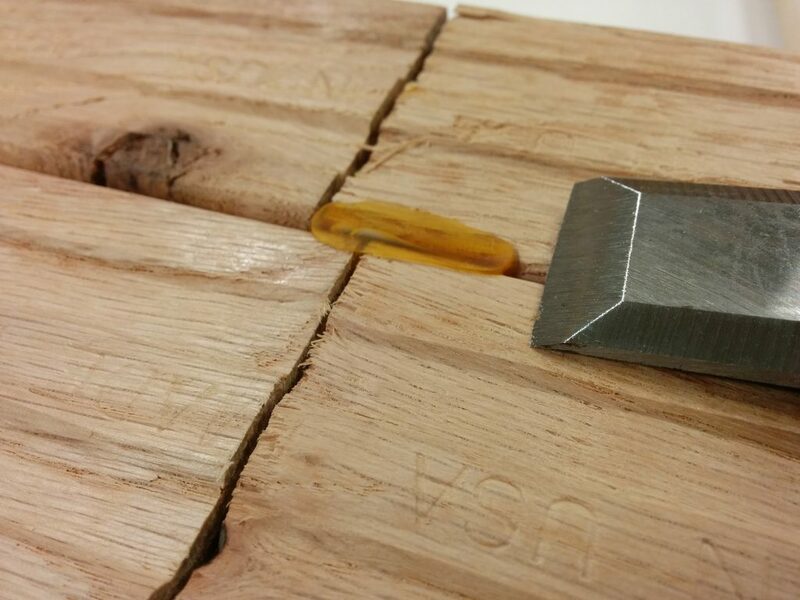 Removing the glue squeeze-out with a chisel. 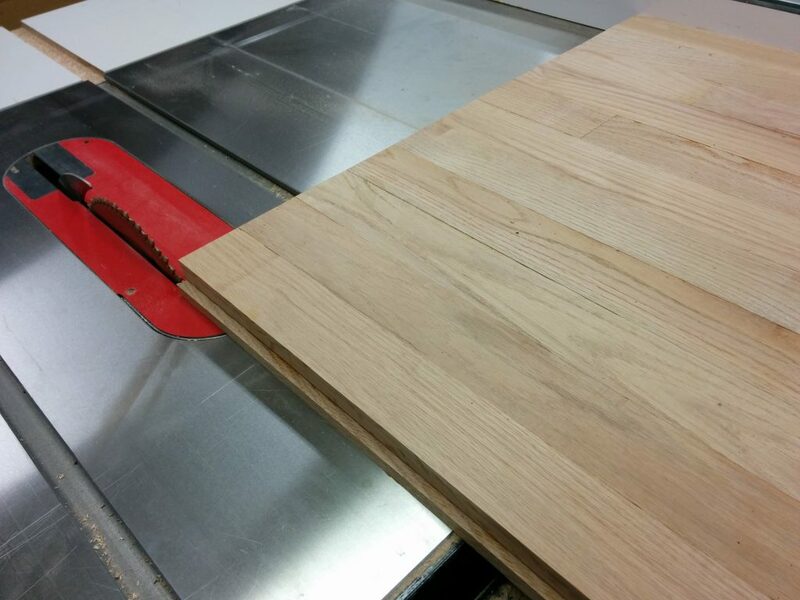 I am attaching two sheets of 1/2″ plywood cut to 2′ X 4′ pieces. I laid them out to see which would be the best placement for them. 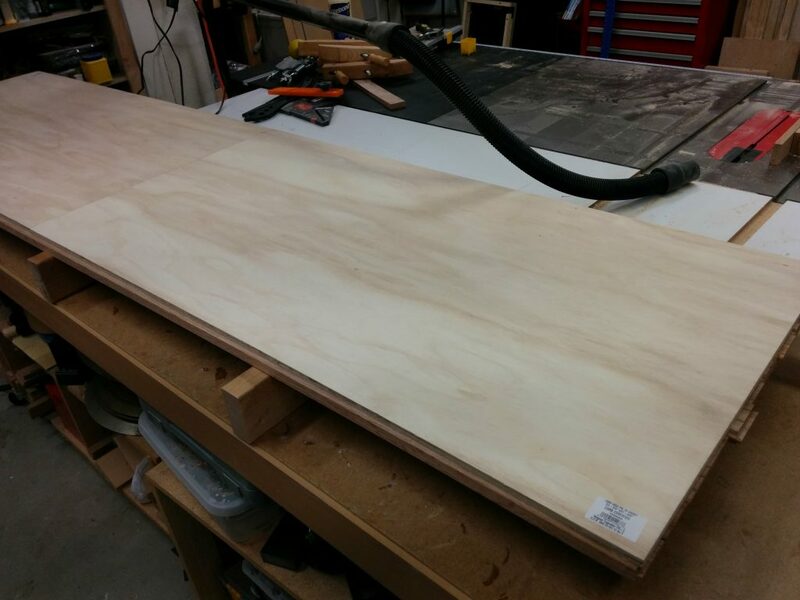 The benchtop so far is about 25″ deep so there will be a lip overhanging the plywood at both the front and back. My initial plan was to cut the front and back edges flat then attach a border, but that plan changed, as you’ll see in a moment. 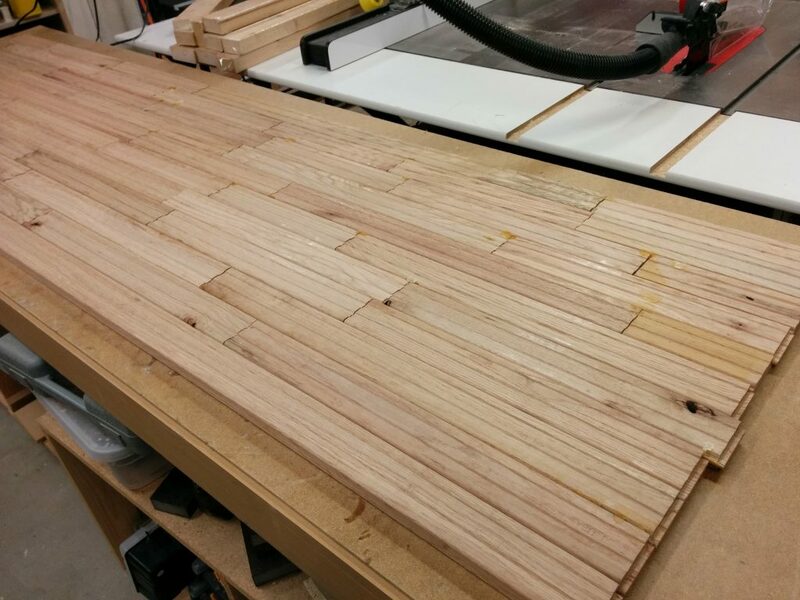 Laying out the 1/2″ plywood. 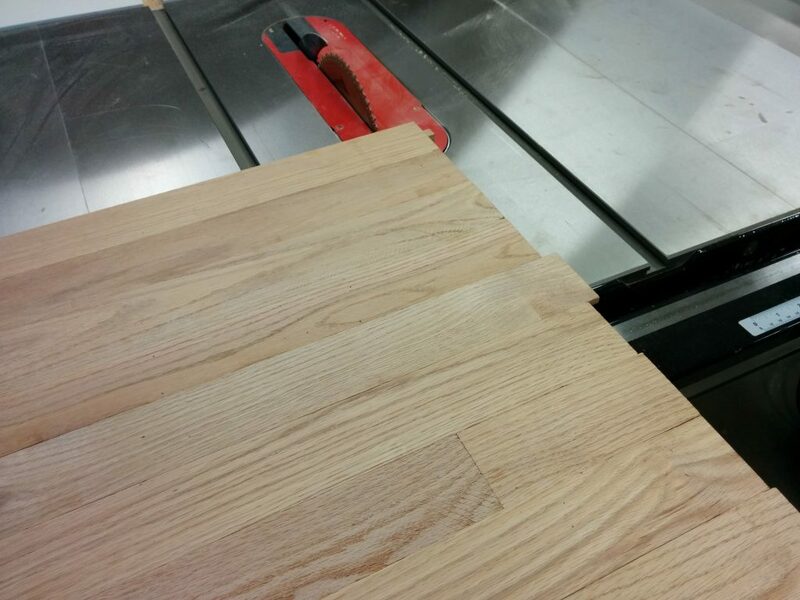 I am using Loctite PL 510 construction adhesive to attach the plywood to the benchtop. 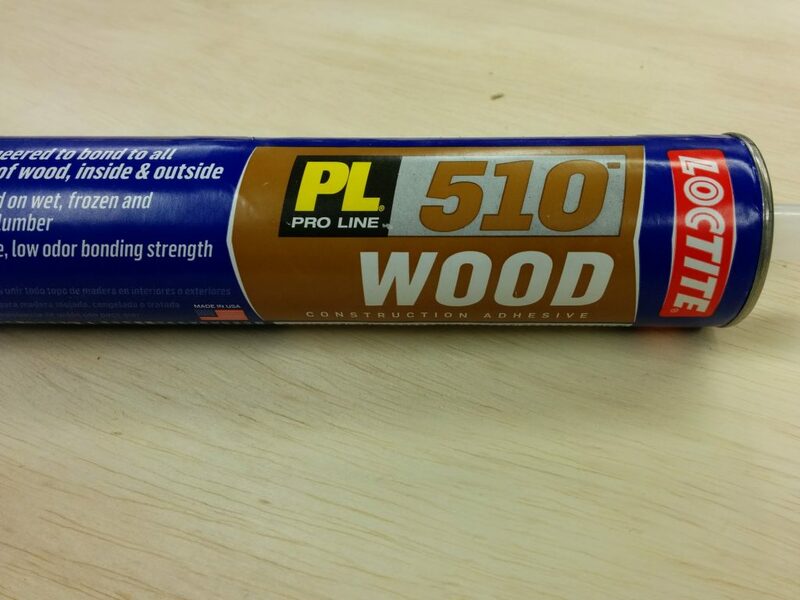 LocTite PL 510 construction adhesive for attaching the plywood. 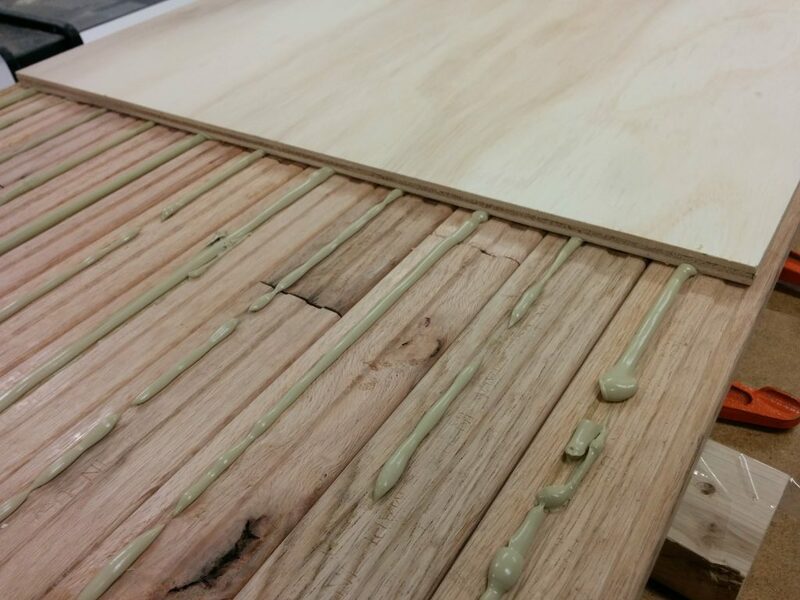 I ran a bead of the construction adhesive down the length of each strip of flooring. This is, of course, working on the underside of the benchtop. Then I placed the plywood sheets on top of that. I tried to get it relatively centered. Attaching the plywood with the construction adhesive. 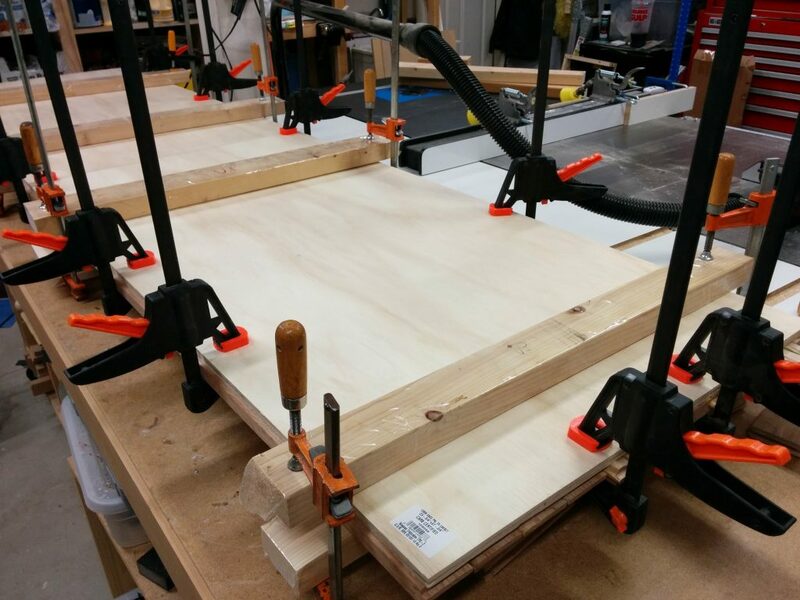 I clamped and cauled the plywood sheets to the benchtop and let it dry for 24 hours. 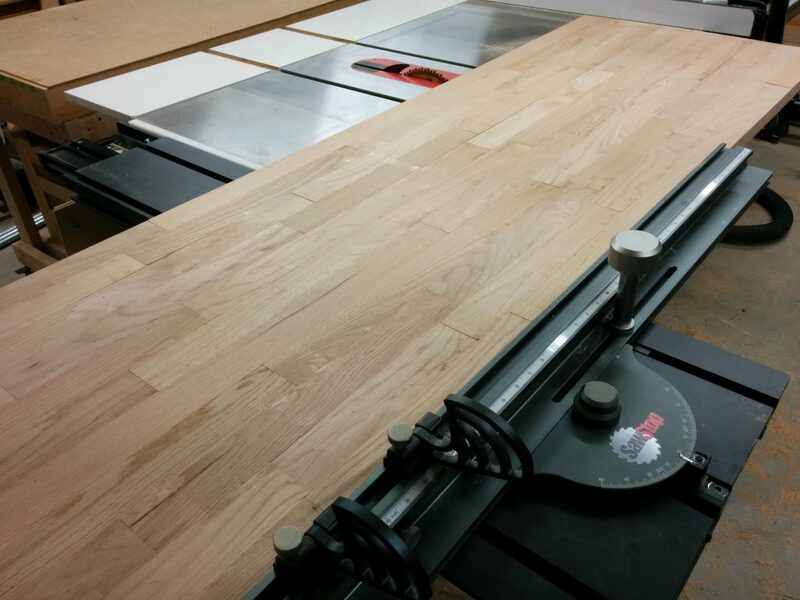 My original plan was to mill down some more of the flooring scraps and make a border along the front and back of the benchtop that was 1-1/4″ tall and 1/2″ deep. This was mostly to cover the plywood that is being attached to the underside of the benchtop. I started by cutting the tongue off the side of the flooring pieces. 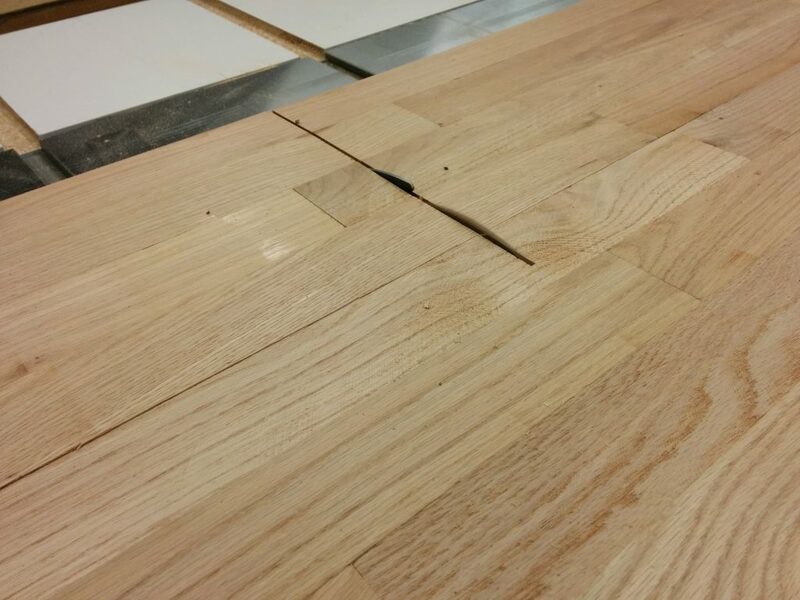 Cutting the tongue off several pieces of flooring. 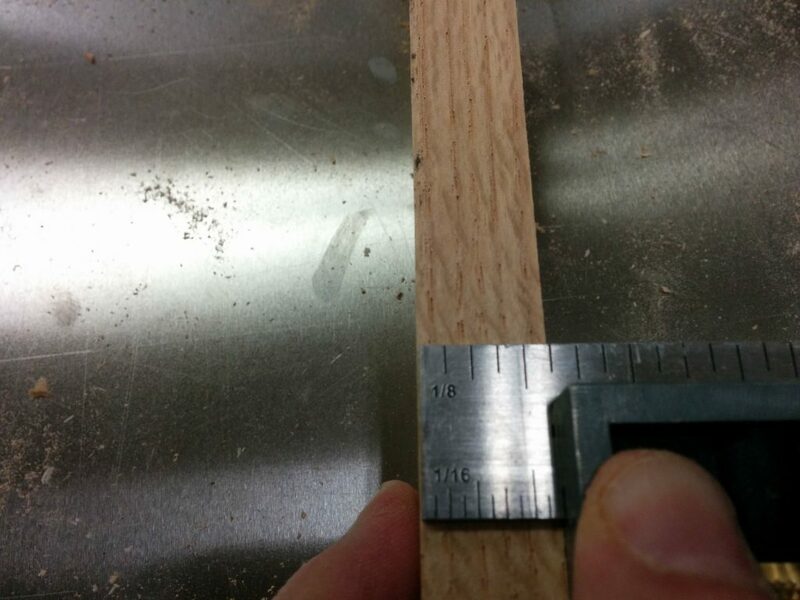 After that I cut off the groove on the opposite side. Removing the groove from several pieces of flooring. Then I trimmed the tongues and grooves off each of the ends. 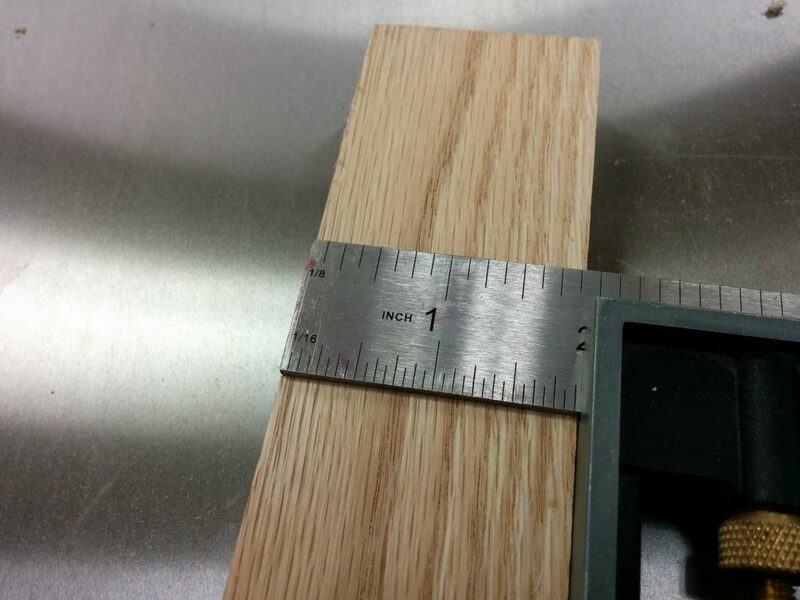 Using the miter gauge to remove the tongues and grooves from the ends. Finally I trimmed off the grooves along the bottom of the flooring pieces. I also ended up shaving a bit off the tops just to clean them up. 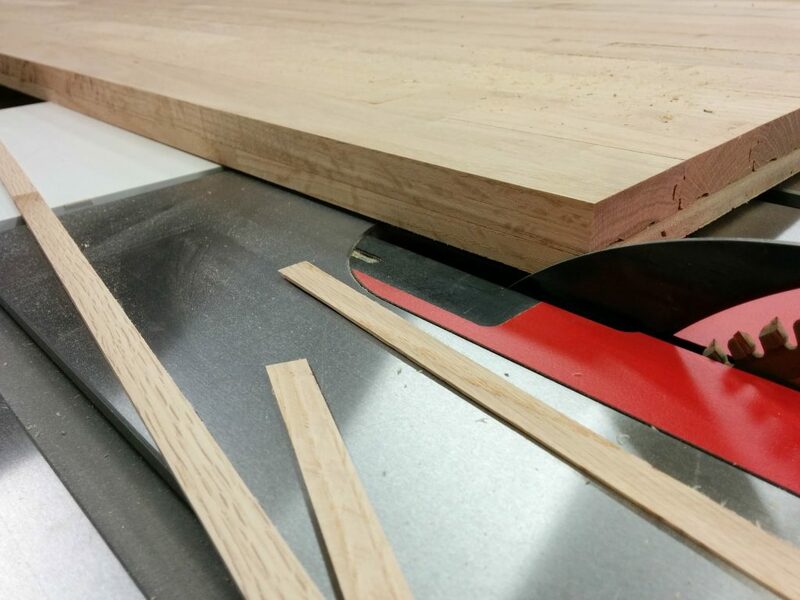 Cutting the grooves off the bottoms of the flooring pieces. This left me with some nice oak stock to use for the front and rear trim. Now this gives me some nice usable stock to work with. 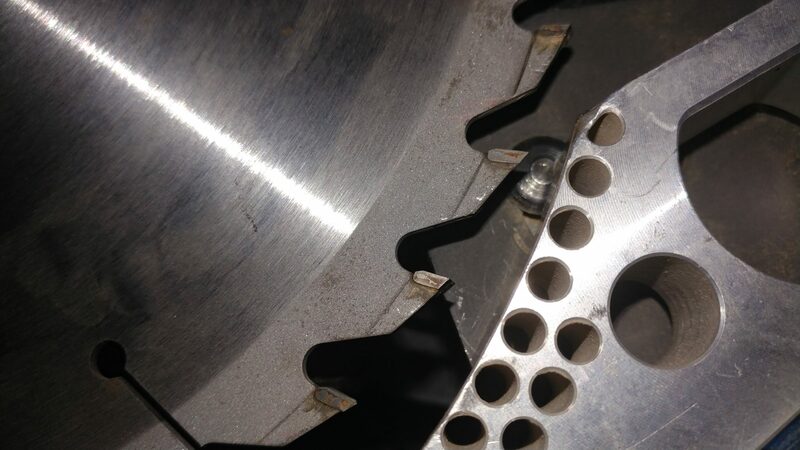 This leaves me with ~1-7/8″ of material to work with. This gives me some nice 5/8″ stock. I removed the clamps and cauls and decided to get my wife’s opinion on the front and rear trim idea. I’m glad I did. 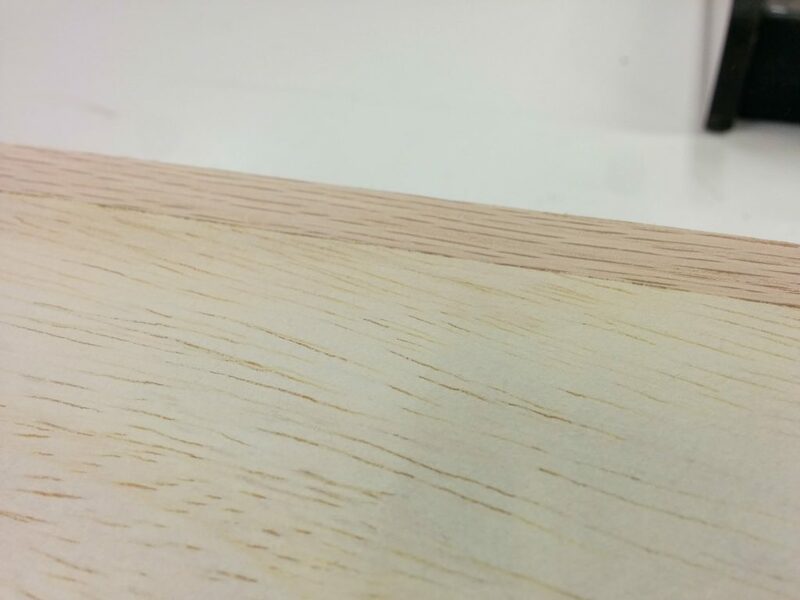 She had the idea of just cutting the milled stock into strips and gluing them to the lip, therefore just covering the plywood and not the edges of the oak flooring. 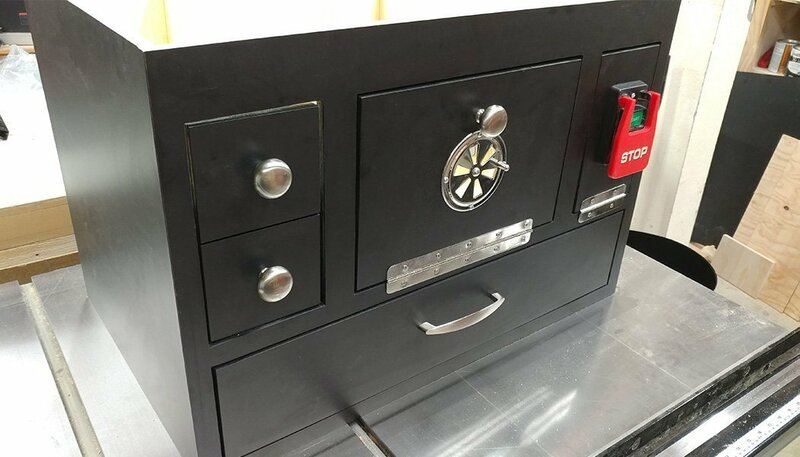 The lip runs the whole length of the benchtop on both the front and back. 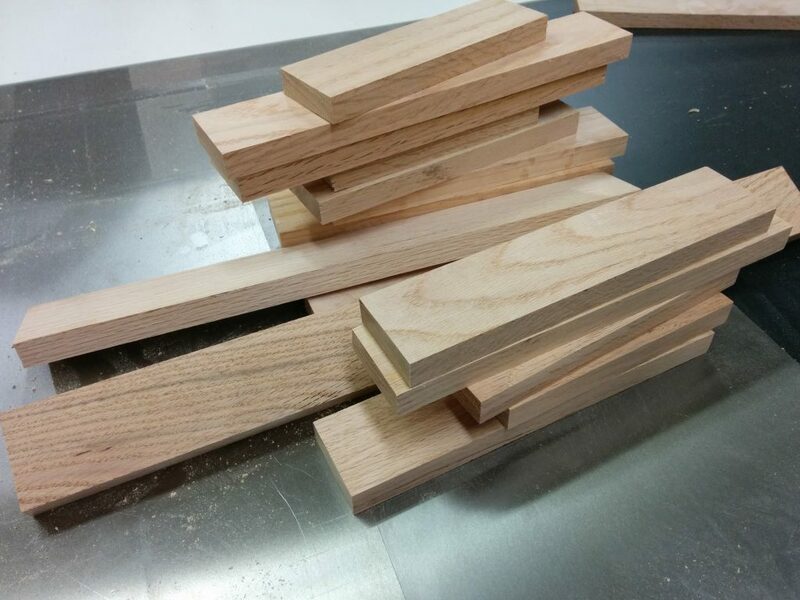 I cut some of the milled oak stock down to usuable pieces. 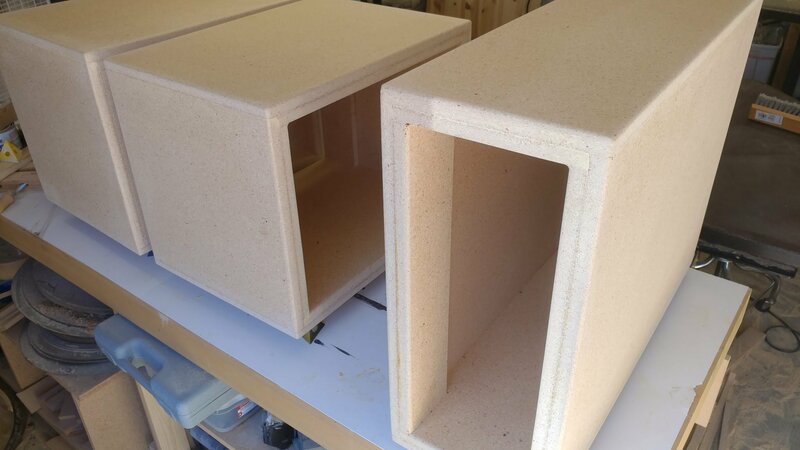 I decided to just make them 5/8″ X 5/8″. 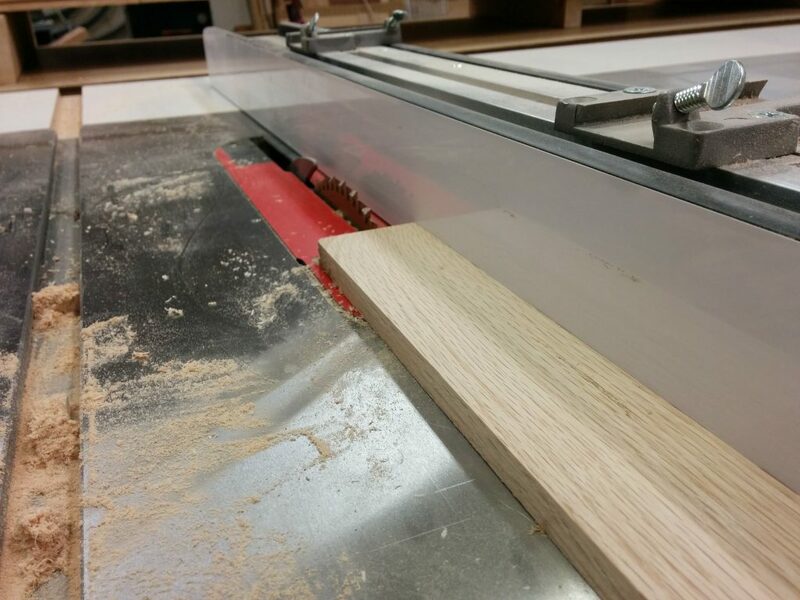 Cutting the oak stock into 5/8″ X 5/8″ strips. 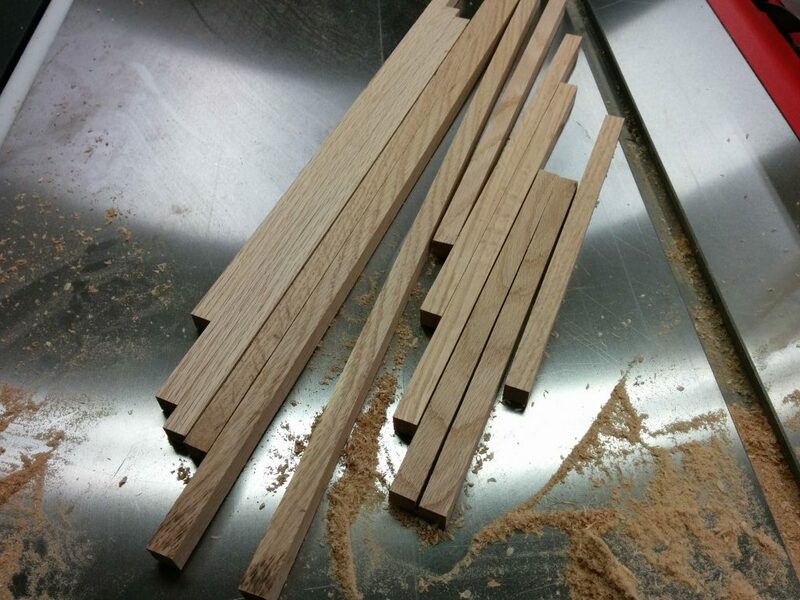 I was able to get enough strips by cutting down just 4 of the milled oak pieces. This leaves me with some more milled oak stock to use for other projects. I laid out the pieces and applied a bead of Titebond 2 to the lip. 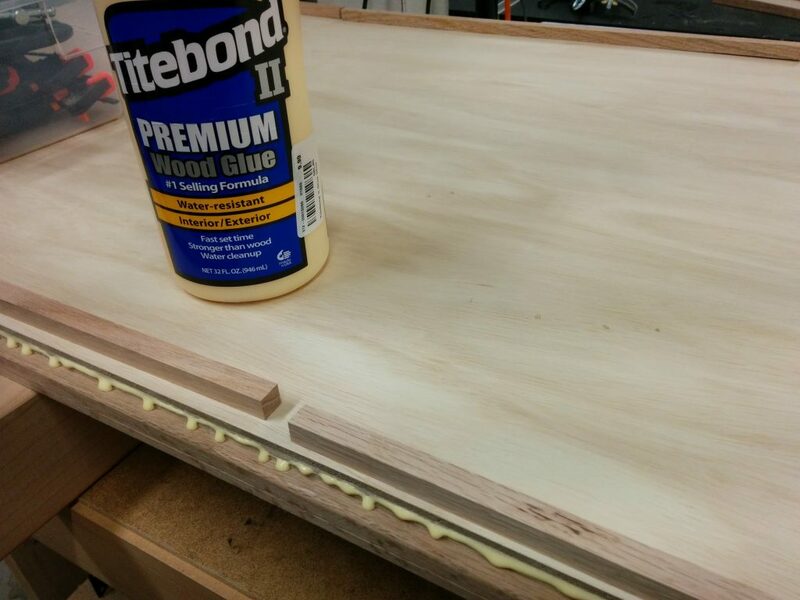 Applied a bead of Titebond 2 to the lip on the underside of the workbench. 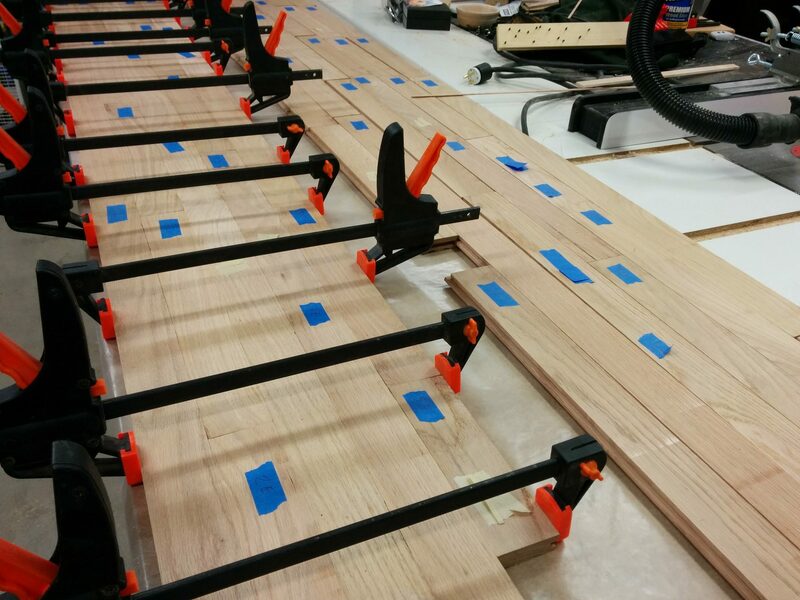 I attached the oak strips and clamped them in place with small quick-release clamps. 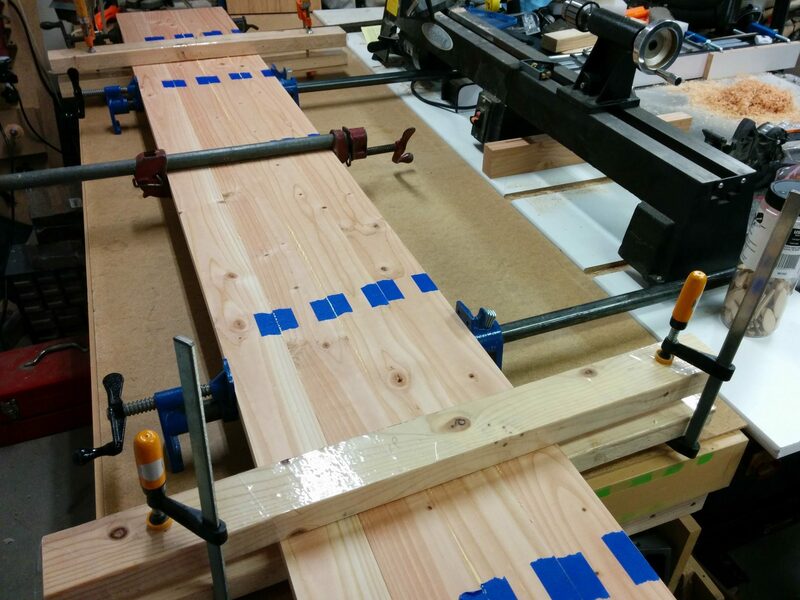 Holding the strip in place with some small clamps. 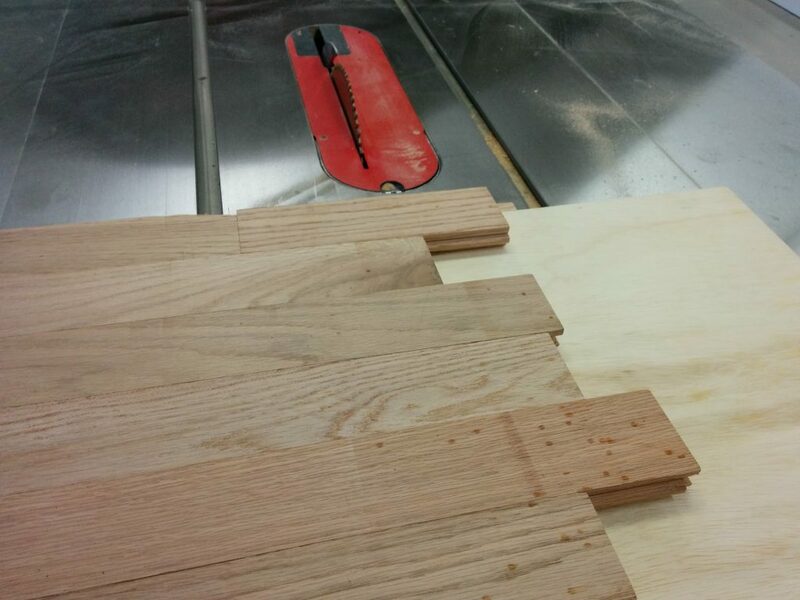 The strips wanted to pull away from the plywood in a few spots so I used some larger clamps to apply lateral pressure. 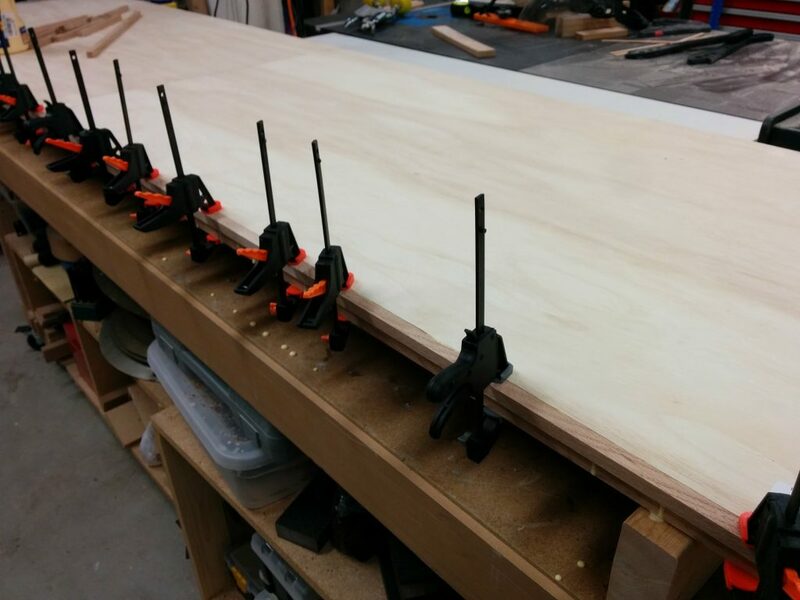 I don’t have a lot of clamps that are over 24″ so I had to get creative with some of them, but it all worked fine in the end. 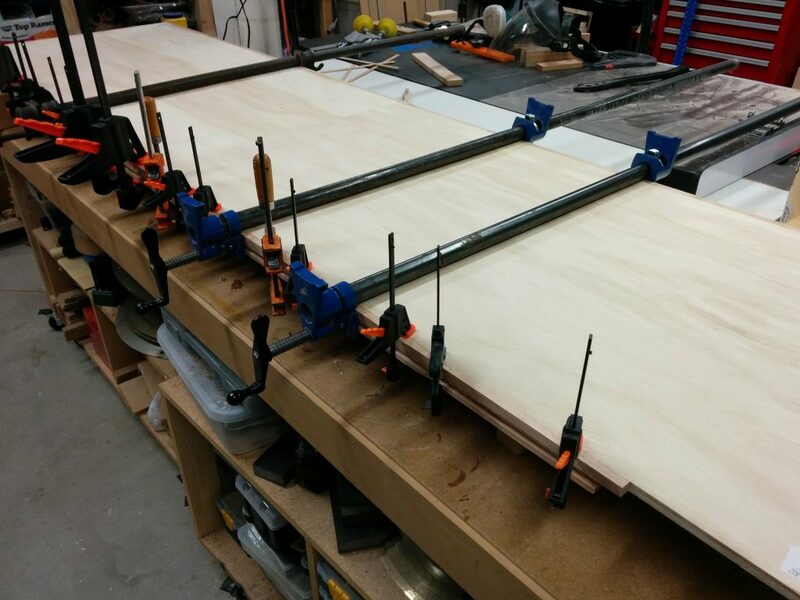 Getting creative with some clamps that are just a bit too short. After the glue dried I did the same thing for the back of the bench. Applying some lateral pressure with some larger clamps. 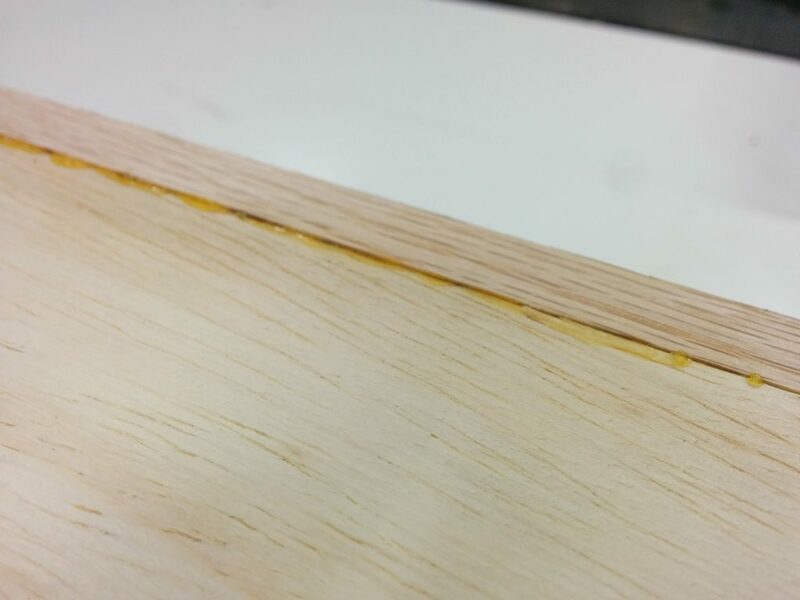 There was some glue squeeze-out on the underside of the benchtop. Got some glue squeeze-out to clean up. Sanding the bottom smooth to get rid of the glue squeeze-out. …it looks a lot better now. Edges look good from the underside. Now it was time to cut everything down to size. 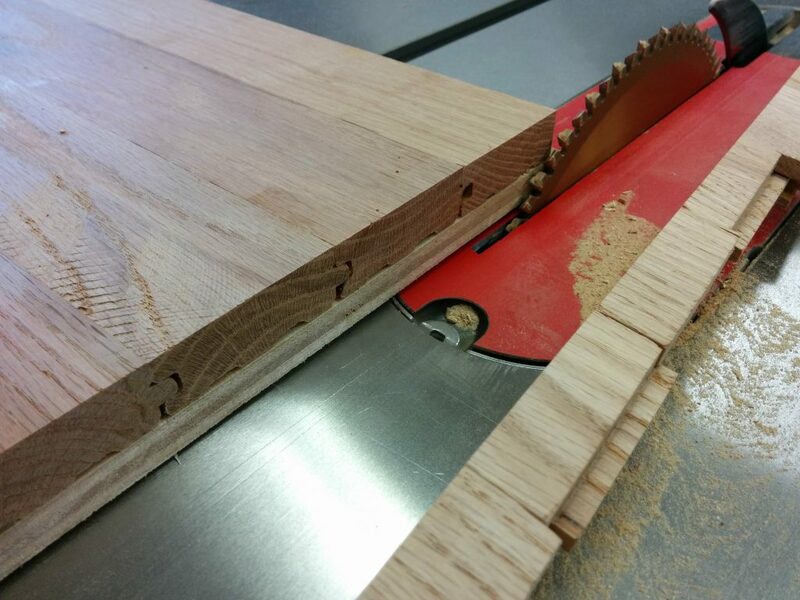 I took the glued up benchtop to my SawStop table saw so I could trim off one end. 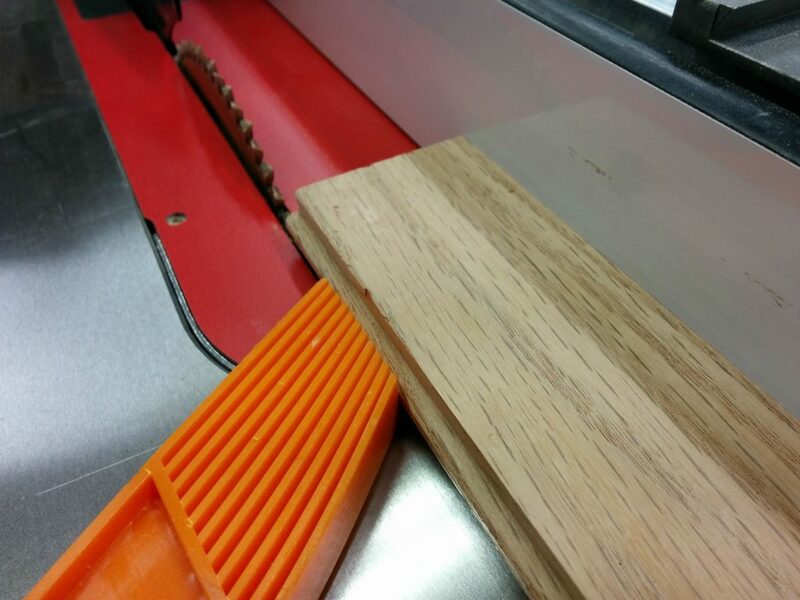 Trimming off the edges of the benchtop at the SawStop table saw using my sliding crosscut table. The ends of the workbench will be covered in metal. I’ll get to that in a future article. All I need now is for them to be flat. Edge is nice and flush now. I then trimmed off the opposite end. 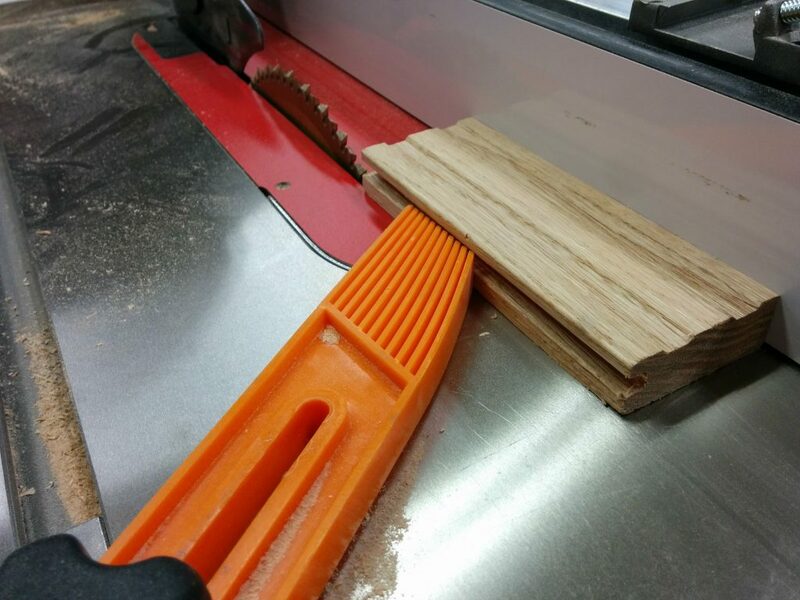 Trimming off the opposite edge at the table saw. It looks so much better now that I have trimmed off the excess on the ends. Both edges are nice and flush. I then trimmed the excess material off the front and the back. 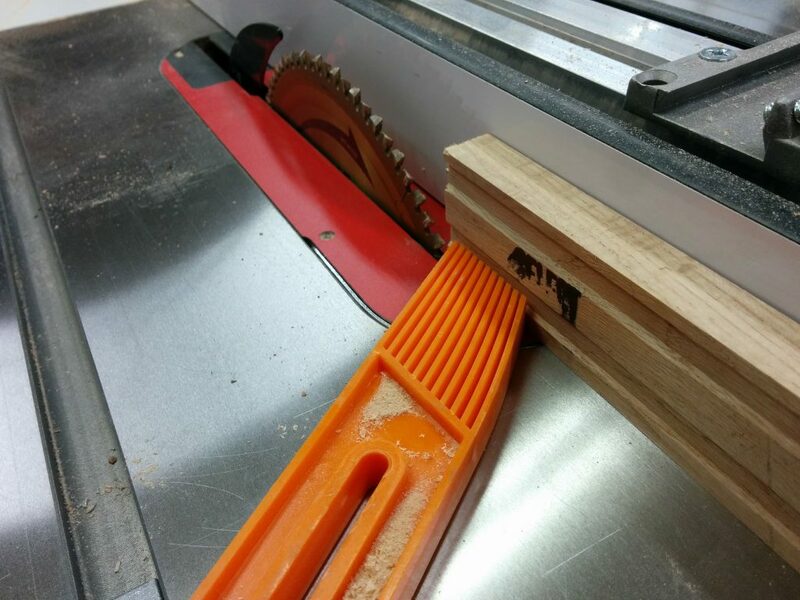 Trimming the front edge at the table saw. This was the look I was going for. The front is nice and flush now. The benchtop was pretty unwieldy since it was so huge. As a result, the table saw left some burning on the edges. The table saw caused a little burning on the edges. 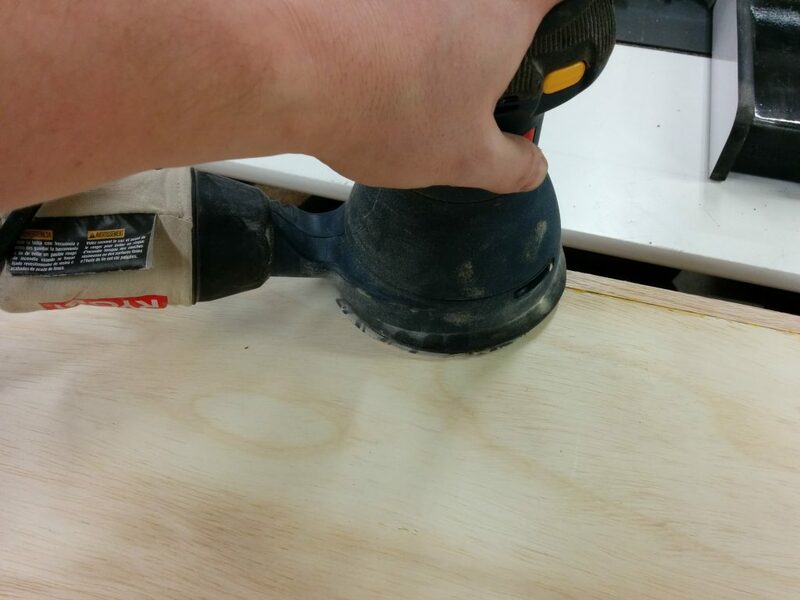 The random orbital sander easily removed the burn marks. 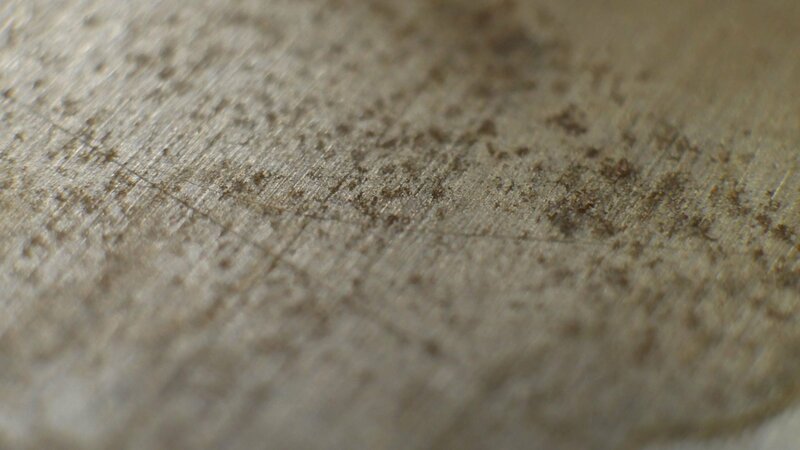 The burning is easily removed with a random orbital sander. 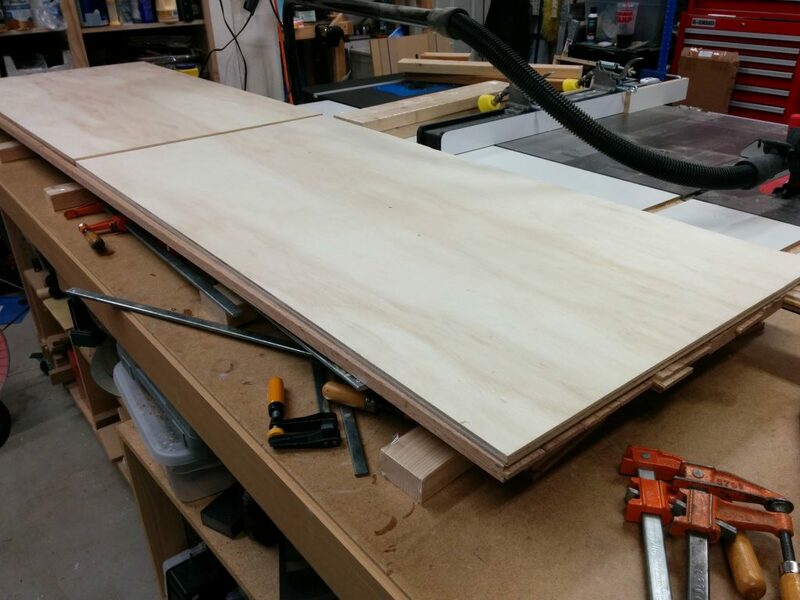 The plan was to turn this into a 5′ long workbench with a 2′ long flip-down wing. 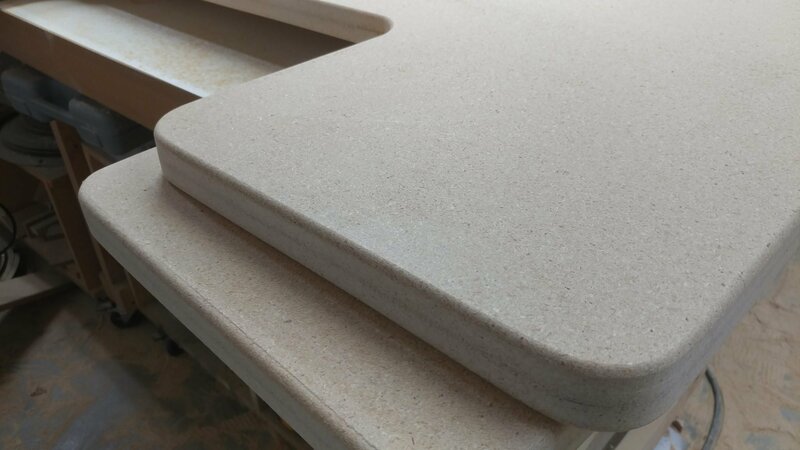 I marked the benchtop at 5′. 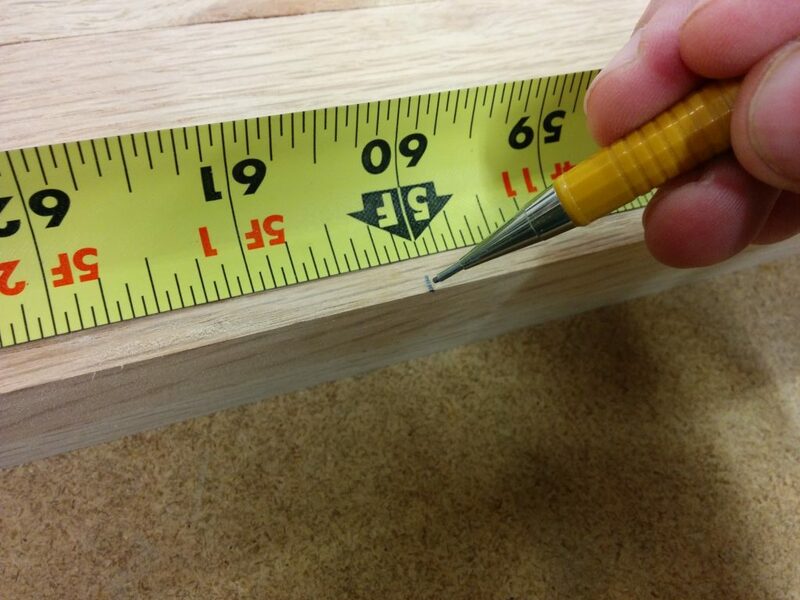 Marking the benchtop at 5′. 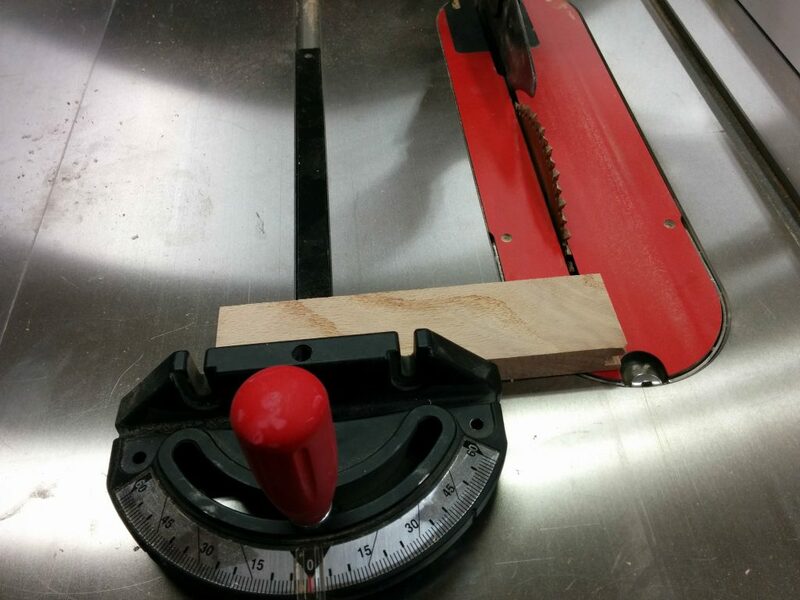 I used my SawStop sliding crosscut table to cut the workbench at the 5′ mark. 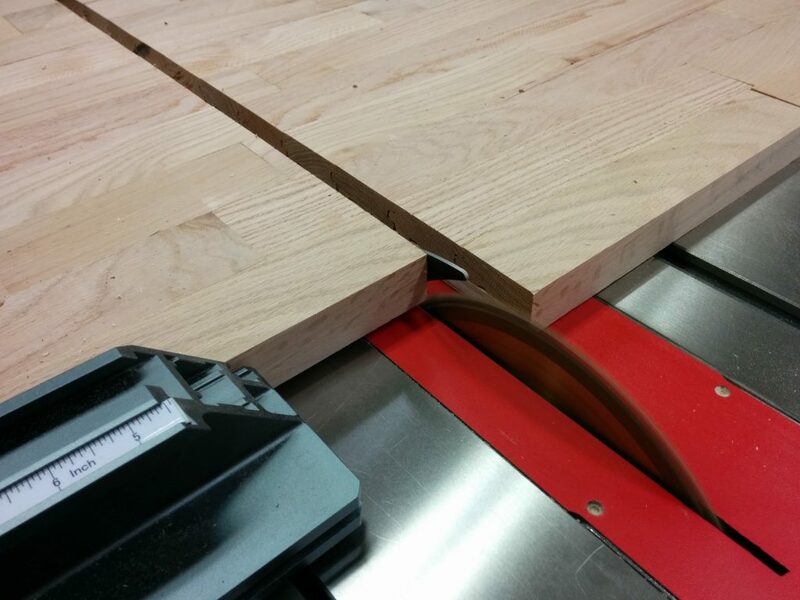 Cutting the benchtop to length using the SawStop sliding crosscut table. 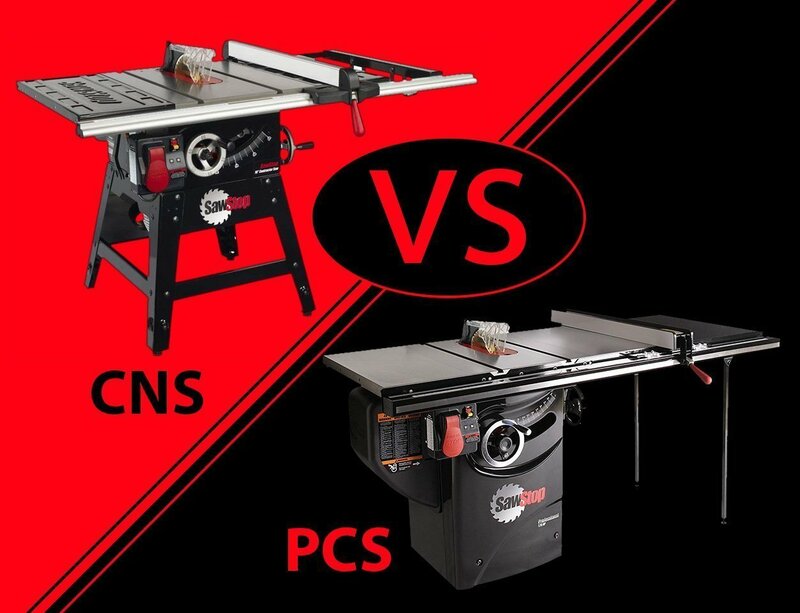 The sliding crosscut table makes it very easy to perform this type of cut. Cutting it down at 5′. It cut cleanly and didn’t really burn it except for where I stopped pushing the material so I could take the picture above. A little sanding and it disappeared. The workbench is now cut to the final size and is ready to be finished. 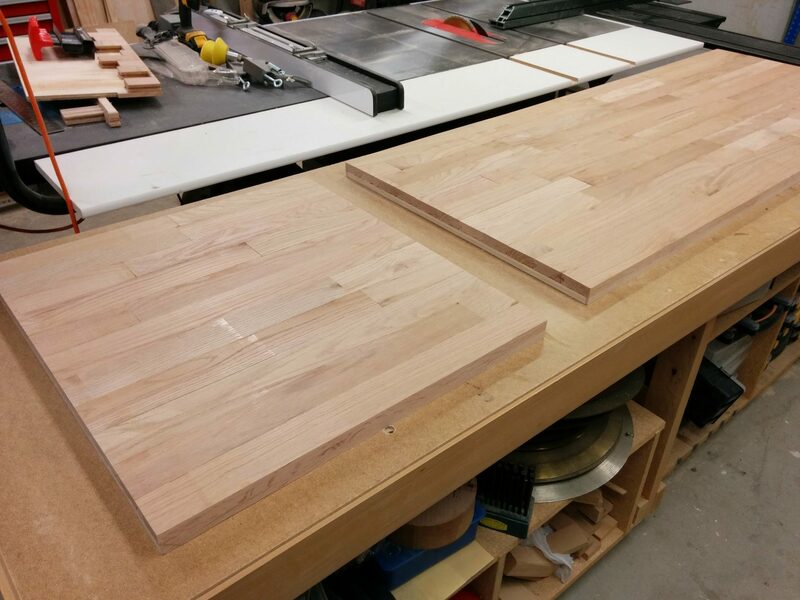 All done with two slabs cut to 5′ and 2′ in length.